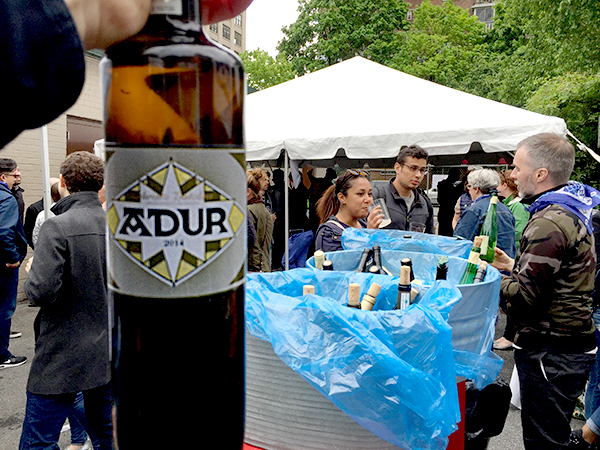 Adur was one of many notable Txakoli wines served at Txikifest 2016 in Chelsea, NYC, where fun was had all around. Despite some overcast skies the atmosphere was casual and convivial with plenty of Txakoli to sample. Txikifest is an annual festival hosted behind Basque restaurant Txikito that celebrates Txakoli wine, the crisp, sometimes slightly fizzy wine made in the Basque country in Spain. Most Txakoli, like Adur, is white, although there is a little rosé and red also made. Adur is from the Getariako Txakolina DO, near the town of Getaria on the Basque coast of the province of Gipuzkoa, which includes the city of San Sebastian. The other two Txakoli appellations were well represented too: Arabako Txakolina DO, in the province of Alava, which includes the city of Vitoria, and Bizkaiko Txakolina DO, in the province of Bizkaia, which includes the city of Bilbao. Txakoli is a wine ideal for serving with food and is part of the Basque Country’s famous food culture. And that is the other key ingredient that makes Txikifest such a pleasure, all the food pairings to enjoy with so many different Txakoli wines. Food purveyors providing eats were: Llama Inn, Colonia Verde, Del Posto, La Newyorkina, Mateo, Pomfrit, Quality Eats, Superiority Burger, and the organizers Txikito, La vara, El Quinto Pino y Tekoá. We hope to see you next year at Txikifest! For more about Adur Click Here. Terroirs of Spain & Castillo de Viñas Wow with 9 Different 90+ Scores!